It’s a small exhibition – small compared to the crazy kermesse of the Fancy Food Show which is held at the same Javits Center in NY during the summer. This show is mainly hardware and software for big restaurants and chains – tableware, chairs for indoor/outdoor, cooking equipment, paper items like doggy bags, menus covers, neon signs, cleaning supplies or services, software programs and financial services like Amex. Food exhibitors included the usual suspects: Dairyland, Baldor. Great companies for big restaurant chains, yes, but another indication that this Restaurant Show has little interest for Gustiamo, Inc. There was another food importer, Corrado’s, which I had not heard of before, where there was a lovely guy singing. It was like being in a smokey tavern in a small town in Italy. When I stopped by, he was singing “Sara’ quel che sara'”, a Ricchi e Poveri hit when I was in my thirties. It means “it will be whatever it will be”, not to be confused with “che sara’ , sara’ “, a completely different song. But the meaning of the title is the same and very appropriate to these grim times. Click on the arrow and listen! Well, hard as it is to admit, I have a horrible voice. I can’t sing if my life depended on it, but I do love it. 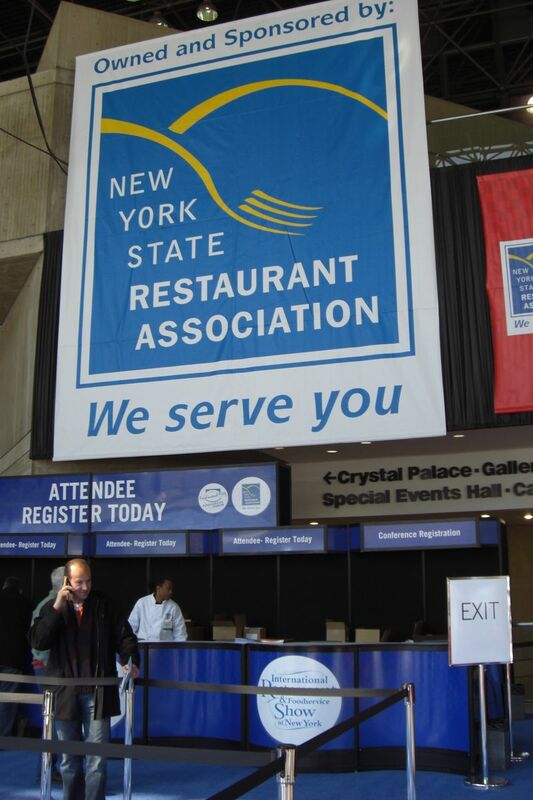 So, this is the deal: if you let me sing, we’ll do the 2010 NY restaurant show. But not just one song – I want to sing for the whole 3 day duration of the show, like the singer at Corrado’s. Beatrice, not sure this is the same Corrado’s but there is a store based in Clifton , NJ and they have just opened on in Wayne NJ, run by the family started out in a farmers market in Paterson NJ , too many years ago that I want to admit to. Quality is better then the super markets and serve a multitude of nationalities and ethnicities. Your high end items will not be found on their shelves, do a substantial business in fresh vegetables and import item in their own name from Italy, Turkey, Hungary, Poland etc. Busy place on the weekends, fun if you have never been and are not used to the “Italian shopping” with Nonno guarding the string bean while la espousa picks out the perfect string beans. Have a bank and a nursery as while as a children’s store and a wine making supply company. PS Did you know there is a Mozzarella Restaurant in NYC, Obika from the Neapolitan “obicco”. 8 different kinds and it is the Italian version of Sushi. know about Obika but never been there. will soon. did you like it? Thanks for the review, where there any new hardware companies or products worth noting that were there? Any new cooking equipment we should know about? Thanks! ciao! there was a Japanese area with many interesting knives. other than that, it was such a long time ago, I really don’t remember. I was mainly focused on food products and I was not impressed by what I saw.